David O. Russell makes a welcome return to quirky, psychological relationship comedy after the assured, but pandering Oscar-baiting of The Fighter. 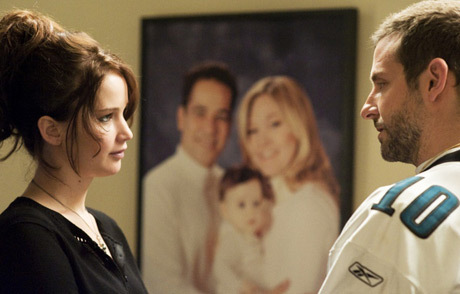 Based on the book by Matthew Quick, about a man who, after a violent mental breakdown, attempts to reintegrate into a socially acceptable lifestyle emphasising positivity, Silver Linings Playbook fits thematically somewhere between the wacky existentialist musings of I ♥ Huckabees and the hilarious, unfiltered honesty of Flirting With Disaster in Russell's oeuvre. The idiosyncratic director/screenwriter proves once again that he's one of the best in the business when it comes to extracting fantastic performances from both proven thespians and leading men more known for their looks than acting chops. Bradley Cooper (Midnight Meat Train) commits to the best acting of his career as Pat Solitano, an obsessively fixated hopeless romantic recently diagnosed with bi-polar disorder. After serving an eight-month stint in a mental institution, Pat is remanded into his parents' custody, the obsessive-compulsive and highly superstitious football fanatic Pat Sr. (Robert DeNiro, showing that life with the Fockers hasn't completely atrophied his comic talents) and the sweet-natured matriarch anchoring her neurotic family, Dolores (the wonderful Jacki Weaver, Animal Kingdom). By the time Pat meets fellow guileless outsider Tiffany (Jennifer Lawrence, delivering an electric performance that could earn her another Oscar nomination), a widow who buries her grief under promiscuity, the fairly standard plot isn't what makes this film so relentlessly engaging – it's the degree of unselfconscious candour and volatile chemistry between Cooper and Lawrence's characters as they negotiate notions of normalcy in an elaborate, unwitting courtship. That's not to reduce the importance of Russell's unique sense of pacing and fluid camera direction, but this is among his least deliberately stylized works. Still, he can't resist indulging in a few tricks. The handful of bombastic zoom shots he peppers throughout the film is just that though: indulgence. When you've got the ability to coax a subtle performance out of Chris Tucker in a film that's all about cutting through unnecessary artifice, there's no need to self-consciously remind viewers of your acumen as a visual stylist.